Can you pass this quiz? 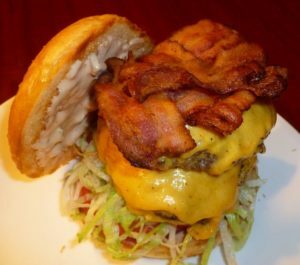 Although there are hundreds of ways to make a great hamburger, there are only a few ways to ruin a burger. Breaking these rules can result in heartbreak and crushing disappointment. If you want to achieve burger greatness and become one with the burger gods, take these rules to heart. If you use poor quality meat. Buy the best meat you can afford. The most popular cuts and blends of beef are made from chuck, sirloin, short rib or brisket; with an overall lean to fat content in the 70-75 percent range. If you use frozen meat. It can be good, but not great. Freshly ground is always best. Grind it yourself, or find a good butcher. If you under-season or over-season the meat. A great burger needs a good pinch of kosher salt on each side (and not much of anything else). If you squeeze all the juices out of the meat while you’re cooking it. If you cook the meat until it becomes dry. A great burger should always be juicy. The meat should have a caramelized exterior and a little pink in the middle. If you allow the cooked meat to sit and get cold before you serve it. If you use cold or un-melted cheese. A great cheeseburger must have melted cheese, which is usually best produced with steam or a broiler. If you use stale or dry rolls/buns. Great hamburgers should have fresh and hot rolls/buns which are either grilled or toasted (preferably grilled with a little butter). There is nothing worse than a dry hamburger (for shame for shame). If you over-dress the burger with condiments and toppings. A little is good, but a lot is not always better. Toppings should enhance the burger, but not overpower it. Great toppings may include onions, pickles, lettuce, tomatoes, caramelized onions, mushrooms, bacon, cheese, chiles, avocado, pineapple, peanut butter, pastrami, BBQ brisket, sausage, onion rings, potato chips, guacamole, chili or fried eggs—just not all on the same burger. If it’s too difficult to eat. A great burger should be able to be held in your hands and eaten without falling apart or disintegrating into a soggy mess. No knives and forks please. It’s okay if the juices run down your arms and drip off your elbows (you’ll be too busy smiling to notice). All told, it turns out that the very best burger eating experiences involve burgers that are fresh, hot, juicy, succulent, tasty and pink in the middle. It’s my favorite food (and it’s easy to see why). Those are the rules. Learn ’em, live ’em, love ’em. Stay tuned to this space as I will be attempting to have this list of rules approved by Iron Chef Bobby Flay, hamburger master, and author of the excellent book Bobby Flay’s Burgers, Fries & Shakes. It’s an absolute must-read for all hamburger lovers.